With the launch of this unit, we officially hit the road as a mobile craft coffee company. In true Chaunie’s tradition, the coffee truck was designed and built by Chaunie and hand full of professionals and close friends. Our original unit that keeps aging like fine wine has been renovated no less than four times since November 2017. We are consistency looking for opportunities to improve its efficiency and output capability. 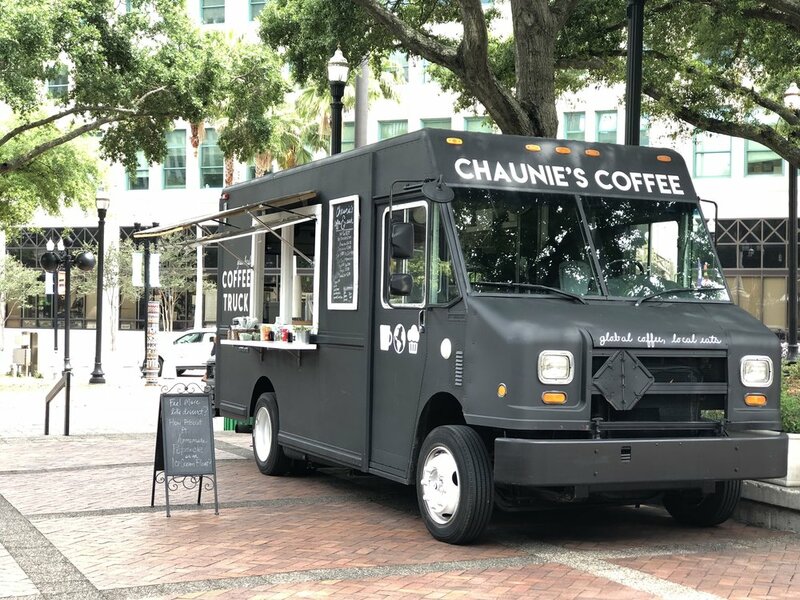 In service since the spring of 2018, Chaunie’s Coffee Truck is a full service espresso bar, outfitted with heavy equipment, including a two-group espresso machine, a high power blender and two quiet powered generators. Due to the industrial grade water system, Chaunie’s Coffee Truck can be scaled to cater anything from a backyard birthday party to a large outdoor music festival. This little cutie falls in line with true Chaunie’s tradition, fully designed and built by Chaunie. The idea of adding an espresso cart to the fleet came about in mid 2018 when we realized there was a demand for indoor, on-site, corporate catering. This type of service provides for a different, more intimate experience. A couple of the things that make this experience so intimate is the fact that on this model, we dropped the generators and added the ability to plug into a wall outlet so that you can set up, virtually anywhere. Limited space calls for creativity which means when you book the espresso cart, you can personalize your service package. This unit can be used outside, as pictured above, but it is more commonly set up indoors at events like weddings and corporate appreciation parties where it can be tucked away or added to the decor.